I recently acquired a new love in my kitchen, the TofuXpress. If you’re vegetarian, vegan, or someone who enjoys tofu (but doesn’t enjoy pressing it between two plates and beneath a tower of heavy objects), go check it out. Right now. I’ll wait. Just look at this beauty. I’m never going to wrap soybean curds in paper towels again! 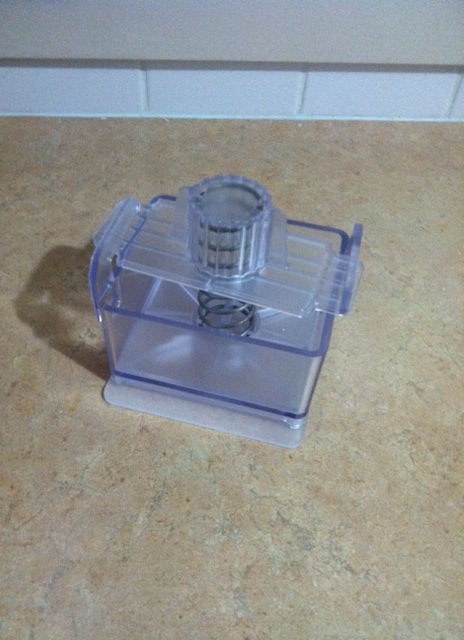 Per my own minimalist rules… if it doesn’t get used regularly (once weekly), it is a candidate for expulsion. Also, a popular minimalist policy is the one-in-one-out rule. I got a new TofuXpress, so I had to rifle through my kitchen to find something to boot out in its place. Or 42. That seems like a good trade. 1 meat thermometer (which is very handy and lovely and not in any way unusable… but I no longer cook meat, so I have no more use for it! 1 rice cooker/crock pot (It was a gift that I asked for so this one was sort of hard, but I have only used it once in three years! 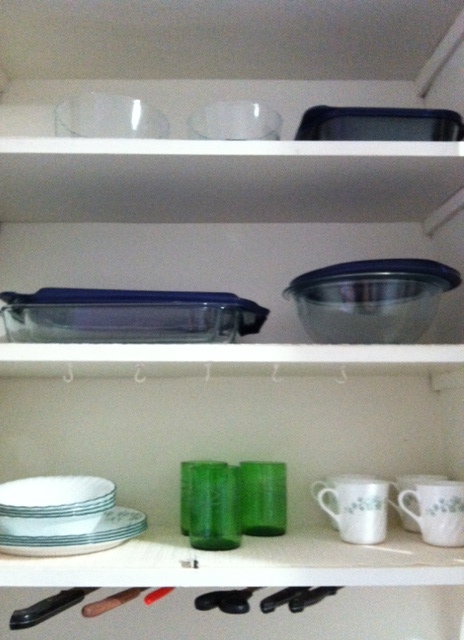 I still haven’t broken up my Pyrex set… here are the contents of my cabinet. Maybe you can help suggest what’s the most necessary to keep. I welcome any advice! In all its glory. Help me get rid of some of that Pyrex! I have a 9×13 baking dish, a smaller baking dish, three mixing bowls, a square baking dish, and two circular bowls I use for storing leftovers or packing for lunch. As an added bonus, check out my nifty knife rack! I used 3M Command velcro strips (for picture hanging, if you listen to the packaging) and put up a magnetic knife rack beneath the cabinet. 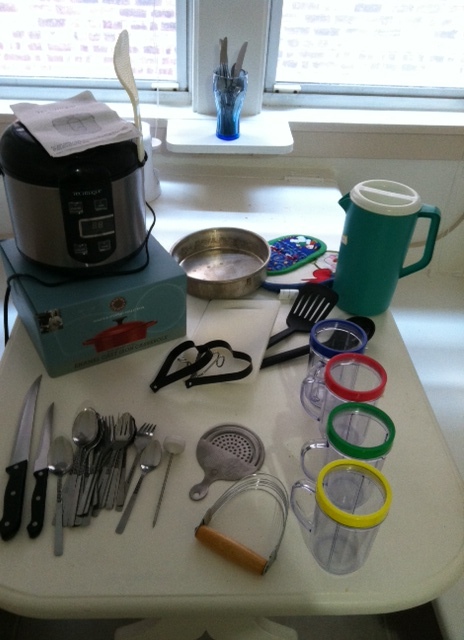 What’s in your minimalist kitchen? My amazing planning skills resulted in a double post today. Enjoy! I honestly don’t think that’s too many dishes or see the need to break up the set if you use it all. There’s not that much space in my cabinets for sure so I admire what you’ve done so far. If you truly want to get rid of some, the way I let go of some of my casserole pans was realizing I can always buy disposable foil pans at holidays when I cook more. And clean up is a breeze cause I can throw the pan away! Oh and I LOVE the knife rack!!! Thanks for your comments! I’m pretty satisfied with the Pyrex for now, I think. I’m not using some of it but I am avoiding the oven in the summer. There’s a good chance the rest of it will get some use later! I adore my Pyrex, and for me it totally fits in my minimalist kitchen. I no longer have fruit bowls, serving dishes, casserole dishes, pudding dishes, or….well…anything that isn’t able to go in the oven and the the table. Because it’s see through Pyrex doesn’t distract you from the prettiness of what you’re about to eat. So, just my thoughts. Keep all the Pyrex, get rid of anything else that it could be used for. Good purging work, and I’m enjoying your blog.